The system recycle bin has an essential role: it allows you to recover accidentally deleted files. The files in it can stay there for a very long time. When they are large, they are likely to be problematic, especially if the disk space is small. In this configuration, the Windows recycle bin must be emptied more regularly. If you are one of the Windows users who very rarely empty their trash, here is a little trick that will help you avoid this task. 1. Go to the Windows settings by combining the "Windows + I" keys. You can also go to the system settings by entering the "settings" query in the Start menu. 3. 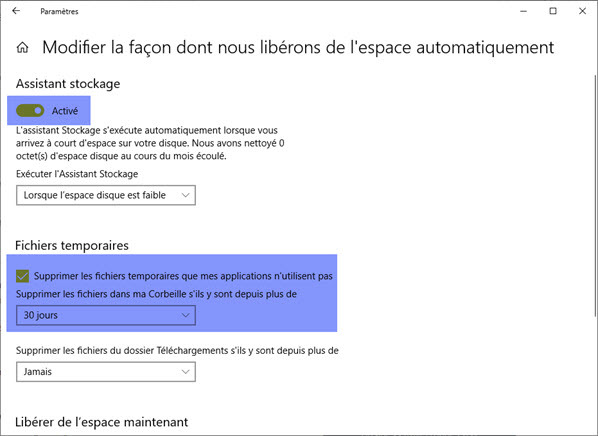 Click on "Change the way we automatically free up space"
4. Activate "Storage Sens", the storage wizard. You can configure it to launch automatically at the chosen frequency (daily, weekly, or monthly), or simply when disk space is considered low. 5. In the "Temporary files" section, check the box "Delete temporary files that my applications do not use". You can then specify a deletion frequency for the files in the recycle bin (never, 1 day, 14 days, 30 days, 60 days). 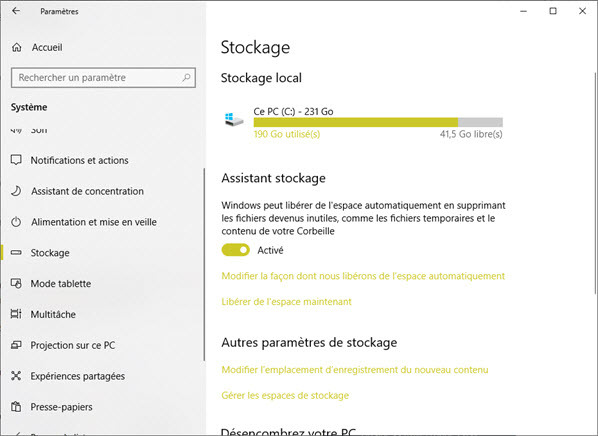 Using the storage wizard, the system will automatically empty the recycle bin according to the chosen deletion frequency. In the event of accidental deletion, be aware that you can try to recover the deleted files using data recovery software. These tools are quite effective, especially when it is a recent deletion and there is very little movement on your hard disk (adding, moving or copying files, defragmentation, etc. ).